Figures announced by the Scouts today show that more adults are coming forward to volunteer in Denbighshire, Flintshire and Wrexham. 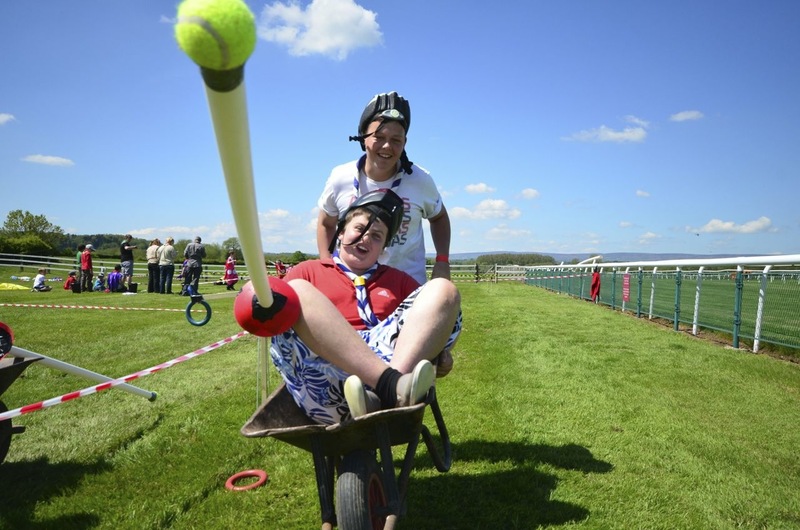 The organisation is now calling on people to step forward to take on support roles to make sure Scouting is enjoyed by more and more young people. Over the last 10 years there has been a 60% rise in the number of adults helping out the Scouts locally. In 2004 the number was 353, with 1,715 young people as members. This year there are 568 adults and 2,356 youngsters. Scouting also continues to grow across the UK where there have been nine years of sustained growth. All these extra adults need supporting however, especially when they’re new to their roles, and this is putting an increasing strain on those adult volunteers in support roles. Jim Butcher, 34 from Wrexham, holds several different support roles in Scouting. He is the group manager of the 1st Rhosnesni Scout Group, supporting a team of over 20 adults, he manages six different Explorer Scout Units, he sits on the District Executive Committee and advises on the running of the Scout Shop. For further Information or interview requests please contact Moz on 07779 272340 – however please note that I’m away on a Scout canoeing expedition with 150 others down the River Wye this weekend (see what we mean about doing lots of roles! ), so if you don’t get an answer, please contact Gordon Richardson, Area Commissioner, on 07970 140004. • The Scout Association was founded on 1 August 1907. • Adventure is at the core of Scouting, and the Association passionately believes in helping their members fulfil their full physical, intellectual, social and spiritual potential by working in teams, learning by doing and thinking for themselves. • Over 200 activities are offered by Scouting around the UK, made possible by the efforts of over 100,000 volunteer adult leaders. This has helped make Scouting the largest co-educational youth Movement in the UK. • One of the challenges that the Scout Movement faces is finding more volunteers to plug the current gap. At present there are over 40,000 young people on waiting lists as more and more young people want to experience the adventure of Scouting. • Studies have shown Scout Leaders contribute the equivalent of 37 million hours voluntary work every year which is the equivalent of £380 million pounds worth of unpaid youth work. • Worldwide Scouting has more than 30 million male and female Members and operates in nearly every country in the world. 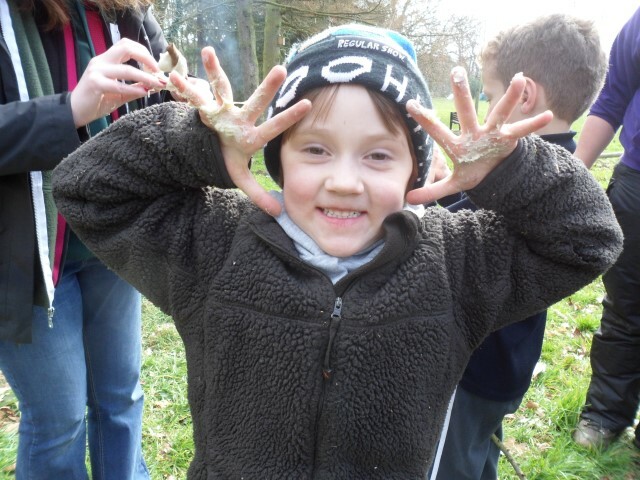 A group of Scouts from the Llangollen area have had a day that many kids dream of – climbing trees, getting messy and lighting fires. Over a hundred Cub Scouts, girls & boys aged between 8 and 10, travelled to Kibblestone International Campsite in Staffordshire. As well as trying adventurous activities like rock climbing, caving and obstacle courses, they got to have a go on a lathe, cooked on on open fire and even got to get up close and personal with barn owls and hawks. Wrexham Scouts celebrated St David’s Day in style last weekend with a Seven Wonders of Wales themed camp attended by over one hundred boys and girls. The weekend was held at a Scout campsite near Colwyn Bay and thirteen Scout troops and Explorer Scout units were represented. For the base on Gresford Bells Scouts had to complete a treasure hunt which led them to the local church where they then had to ring the bells and have a go at hand bells. Meanwhile the Pistyll Rhaedr base created it’s own waterfall of sorts when the youngsters had a go using the fire hose from a Green Goddess fire engine which is owned by one of the leaders. Natasha Vening, aged 13 from Rhosnesni Scouts, said: ‘I enjoyed the hiking base the best as we had to get to a destination, but we could plan our own route, practice map reading and we solved clues along the way. 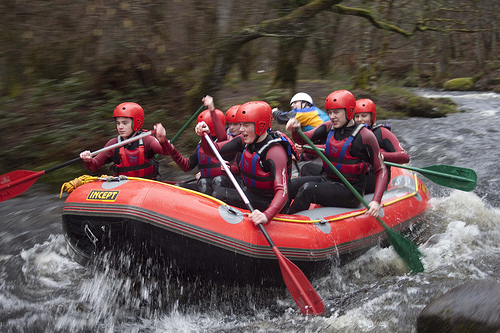 On the Sunday the older Explorer Scouts were given a treat when they were taken white water rafting, representing Llangollen Bridge, at the National Whitewater centre at Tryweryn. The Scouts welcome new members, both young people and adult volunteers. Call 0845 300 1818 or visit scouts.org.uk to find your nearest group. 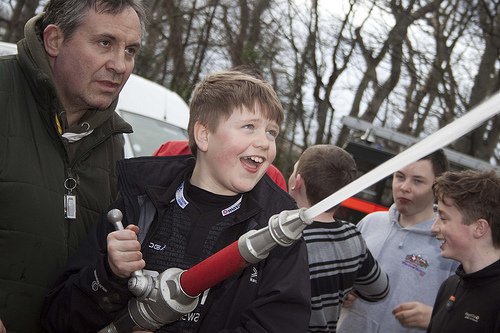 – Please find attached two photos: one of Scout Ben Williams, aged 10, having a go on the fire engine hose, and the other of Explorer Scouts rafting.